A week long best practice study mission was completed. Organisations where practices were shared with representatives from the Bahrain Centre of Excellence include Hutt City Council, State Services Commission, NZ Defence, NZ Police, Education Review Office, Porirua City Council, SCION, Wintec, Waikato District Council, Contact Energy, Spectrum Care Trust and Accident Compensation Corporation. Greg Watson wins a copy of ASSESSOR at the World Business Capability Congress during the PYXIS business card draw. Watson Real Estate went on to win the 1st Global Benchmarking Award, win the SME category in the NZ Best Practice Competition and also runner up to 1st International Best Practice Competition. Congratulations to Greg Watson and his team at Watsons Real Estate Limited. Michael will be speaking at the World Business Capability Congress​ incorporating the 27th NZOQ Conference, 7th International Benchmarking Conference, and New Zealand Business Excellence Awards. The theme of the congress was "Driving Excellence> Innovation> Productivity> Export". 12/01/12 - Our 2008 Flight or Fight presentation to Manawatu Chamber of Commerce is still relevant today. 20/08/11- PYXIS runs Applicant Workshops in Karachi (15 - 17 August) and Lahore (18 - 20 August) to the inaugural Prime Minister Quality Award for the National Productivity Organisation. The PMQA is based on the 2009-2010 revision of the Criteria for Performance Excellence. The National Productivity Organisation of Pakistan held its Award Training workshops for applicants to the Prime Minister Quality Award (PMQA) in Karachi and Lahore on 15 - 20 August 2011. 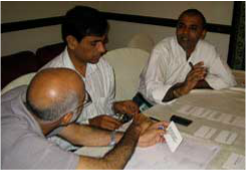 Michael Voss of PYXIS facilitated the Applicant workshops in Karachi and Lahore. During each 2.5 day workshop Applicants were taught how to understand the Criteria for Performance Excellence, and introduced powerful tools to enable them to respond to the Criteria areas to address, assemble their Awards Application, and prepare for the PMQA Site Visit. ​Michael also ran two half day seminars for NPO representatives on how to build a sustainable Awards programme and the role Awards programmes play in raising the performance of organisations through commitment to continuous improvement. 18/08/10 - PYXIS runs the first TRADE Benchmarking Workshop in New Zealand. PYXIS and COER have developed and run TRADE benchmarking workshops overseas. The Auckland workshop held on 17 - 18 August was run in association with the New Zealand Business Excellence Foundation and COER. ​22/09/09 - PYXIS attends the Asian Network for Quality Congress held in Tokyo on 16 - 19 September 2009. PYXIS owner, Michael Voss attended the Asian Network for Quality Congress held at Weseda University in Tokyo on 16 - 19 September 2009. There were over 400 representatives attending Congress. 100 papers were delivered across five parallel streams over the first two days. There was a mix of academic and practical papers covering themes including assessment, marketing, process control, strategy, quality management in healthcare, and statistical tools. The ANQ Chairperson, Janak Mehta gave an excellent insight into the ANQ Way and the role that quality has to play in the modern world. Michael attended Congress in his role as Development Director of the New Zealand Organisation for Quality (NZOQ). As their representative he received a membership plaque. NZOQ is the first organisation outside of Asia to become a member of the Asian Network for Quality. On the third day of Congress, three site visits were available. 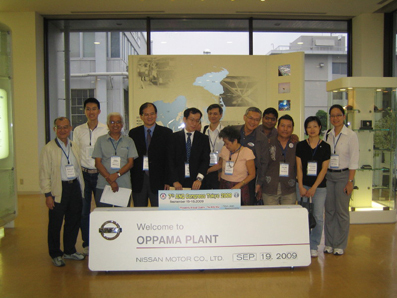 Michael visited the Nissan Motor's Oppama Plant where production of its Cube and Note model vehicles was observed. This was the largest and most successful Congress the ANQ has run since its formation in 2002. The benchmark has been set for the 8th ANQ Congress on 18 - 22 Oct 2010 in NCR Delhi, India. 10/09/09 - Top tips : Do Or Die Management Magazine publishes article describing seven areas organisations need to focus on.